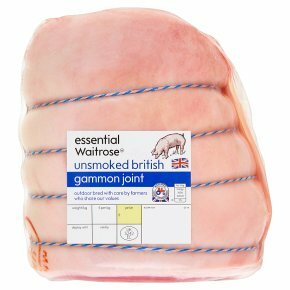 A great value unsmoked large gammon joint - outdoor bred with care by farmers who share our values. Time: 30 mins per 500g + 30 mins. To boil. Remove all packaging. Place gammon in a large pan of water. Bring to the boil, reduce heat, cover and simmer. Cook thoroughly until the juices run clear. Leave to rest for 10 minutes before carving. For best results: remove strings and rind and discard. Once cooked, transfer to a baking tray. Score fat and brush with honey. Finish in a hot oven for 10 minutes.